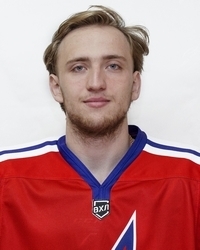 In this edition of our continuing Not A Word About Hockey series we’re going to talk to Omskie Yastreby forward Maxim Melnikov. Omsk are battling for a playoff berth, but Melnikov found a minute to speak about his spare time, character traits and much more. - My mother decided on what I eat when I’m home. It’s our team doctor’s job when I’m at a practice on on the road. My favorite meal is sushi, although I eat meat more often. I’m not much into vegetables. - I have a pet. It’s a British breed cat. His name is Zhorik. - I don’t have a lot of spare time during the season but when I get some I like to go to the movies or a café. In the summer I prefer to take it easy somewhere at the beach. Turkey, for example. I would like to visit English, go to a soccer game there and feel the atmosphere of those stadiums. - I don’t have a favorite movie or an actor. I don’t have a movie I want to re-watch. As for TV series, I like Game Of Thrones. - I listen to all kinds of music, but mostly rap. The latest track I’ve added to my playlist was Dym by Lyosha Svik. - I’m kind, fun and pretty modest. Sometimes even shy. I’m not sure if it’s an upside or shortcoming. My biggest shortcoming is that sometimes I give in to my emotions. When I’m in a bad mood I can often bring somebody down as well. - I have never felt like not going to the game. I don’t have a recipe for this. I always want to play. - A real man must me brave, understanding and faithful. - I inherited all of my good qualities from my parents. - When I meet a new person, the first thing I look at is how they behave. I don’t think anybody likes snobs or niminy-piminy people. - I’m a gambler and I always want to win. If I lose at anything, I won’t find comfort until I get my revenge. - I don’t have a role model when it comes to style. I just pick stuff that I like and suits me. - I don’t pay attention to brands. If I like something, I will get it regardless of its brand. Although, I do have preferences when it comes to athletic wear. As for the colors, I prefer classic – black and white. I prefer athletic wear because I feel more comfortable in it. - I grow beard but not because I like or something else. I just don’t like shaving much and the beard actually looks good on me. - My ideal girlfriend is kind, smart, beautiful and understanding. Actually, I just described my girlfriend but she has a lot of other great qualities! - My girlfriend loves hockey but not just because of me. Her brother also plays hockey. She started going to his games a long time ago. When we first met she didn’t even know I was a hockey player. - Relationship is important because no matter what happens I always have someone to share it with and be supported. - I think I would sign my son up for hockey. But if something goes wrong, I would force him to continue. If I’m going to have a daughter, I would probably sign her up for gymnastics. These sports are great for health. - If it weren’t for hockey, I would have chosen another sport – soccer, for example. If it had to be something outside of sports, I would do my best to open my own business. - I study at Siberian State University of Physical Culture. Every year I have lesser time to go to classes but I know my classmates and do my best to catch up on my studies. - Higher education is great but to me the most important thing is to be able to think straight and develop thoroughly in many aspects.